Ubiquiti Networks continues to disrupt the wireless broadband market with revolutionary technology at breakthrough pricing, by introducing the airFiber® AF‑11FX, a radio purpose-built for outdoor PtP bridging and carrier-class network backhauls using the licensed 11 GHz radio band. The AF‑11FX breaks free from the congested 5 GHz band to help meet the growing need for broadband capacity. For maximum flexibility, the airFiber AF‑11FX works with the Ubiquiti® AF-11G35 antenna, or with most third-party antennas using an optional adapter kit (not included). True Full-Duplex Design - The AF‑11FX offers a true FDD solution that fully satisfies all licensing requirements for the 11 GHz band. Ultra-Low Latency - Overall customer experience and system capacity are enhanced with FDD performance. Enhanced Robustness - The AF‑11FX features a unique, built-in, rain-fade mitigation strategy for increased link robustness. Extended Range - The RF power amplifiers feature a unique bias scheme, allowing high-order constellations at longer ranges. Optimized Channels - The airFiber AF‑11FX can use single (SISO) or bonded (MIMO)* channels, depending on your specific licensing requirements. The AF‑11FX also features different channel width sizes to suit your deployment needs, and you can independently configure TX and RX channel frequencies. Reconfigurable Duplexers - The AF-11FX features a unique modular duplexer design to suit multiple frequency configurations. Each AF-11FX radio can be configured to support any allowable frequency by simply changing the duplexers (sold separately) for high‑band or low‑band use in the 10.7 - 11.7 GHz allocation. Each duplexer has a low channel and a high channel that can be configured by simply reversing the position of the duplexer. Highest Performance Value - The compact AF-11FX supports high-order constellations – up to 1024QAM – allowing it to deliver the greatest spectral efficiency in its class. Ubiquiti’s INVICTUS™ 2 custom silicon and proprietary radio architecture are designed specifically for long-distance, outdoor wireless applications, providing superior performance, long-range capability, and higher delivered throughput. PoE power can be supplied on the DATA port, using the provided PoE adapter. DC power can be supplied using the terminal block. Versatile, Ruggedized N-Type Connectors - N-connectors allow the AF‑11FX to be used with either the Ubiquiti AF‑11G35 antenna or a variety of commonly available antennas. Specially designed silicone boots provide a weatherproof barrier against dust and moisture. Ubiquiti offers the AF-11G35 antenna, specially designed for the AF‑11FX radio, so that installation requires no special tools. The AF‑11G35 comes preconfigured with V/H polarization, and can be configured to support ± 45° slant polarization for improved noise immunity and Signal‑to‑Noise Ratio (SNR), dependent on regulatory region. 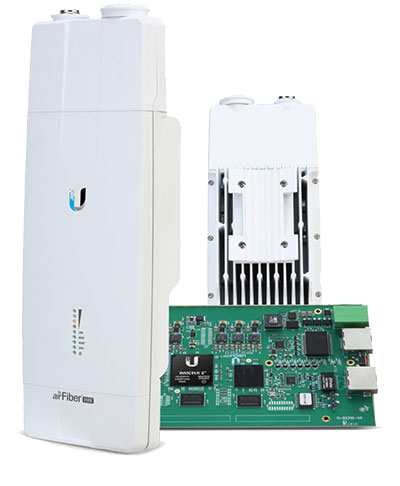 Download the Ubiquiti airFiber 11FX Datasheet (PDF).